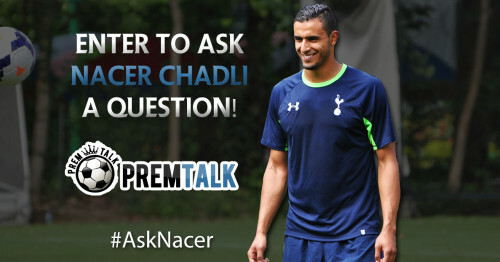 Prem Talk readers get a chance to ask Nacer Chadli a question! Following Tottenham’s debut Google Hangout with Lewis Holtby last month, Premiership Talk has once again teamed up with Spurs to give readers an exciting chance to ask new Tottenham signing Nacer Chadli a question! Three lucky fans will have their questions selected and posed to the Belgian star, and Chadli will answer those questions on video to give fans insight into his life at White Hart Lane and life in the Premier League. Visit our Ask Nacer page on Facebook, like Premiership Talk, and then submit your question! If you don’t have Facebook, simply send an email to competitions@premiershiptalk.com with your Name, location (City/Country), and question! Stay tuned to Premiership Talk’s Facebook page and our website for the announcement of the winners and a video of Nacer Chadli answering the questions! Chadli signed for Tottenham this summer, and made his Premier League debut this past Sunday in the club’s 1-0 win over Crystal Palace. He signed from Dutch club FC Twente, so fans will be able to get an insight into his move, life in London, competing in the Premier League, and what it’s like behind the scenes at White Hart Lane. This competition ends at 5pm GMT on August 28th and winners will be announced on the 29th of August. The video of Nacer answering questions will be released at the end of the month. Don’t hesitate – jump in and ask Nacer a question today! score an own goal tommorw. Hi nacer first ilike you as player ok what's your country origin? how old are you?